Grapple Force Rena from developer GalaxyTrail is a sweet action platformer where your magic bracelets allow you to hook into any surface. That includes enemies too, as you hook into them and throw them out of your way. The gameplay and style is very reminiscent of early platformers we might have seen on something like the Sega Mega Drive (Genesis), it feels like a genuinely decent throwback. In this unique action platformer, use Rena's magical 'grappling bracelets' to latch onto any surface - not confined to specific 'grapple points', you can swing freely through the game's varied environments. You'll come up against some fierce foes, but don't fret! By grabbing enemies and tossing them into each other, you can make quick work of any threat. Creatively use the environment and your enemies' powers against each other to turn the tables in your favor! 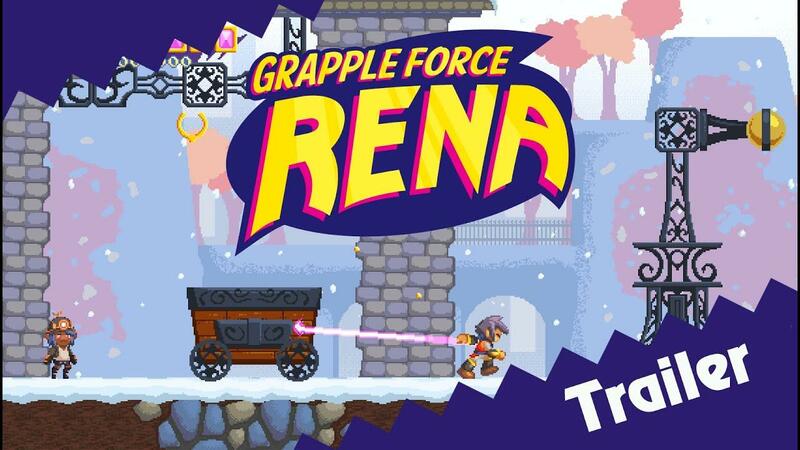 Inspired by the mid-90's action games of legendary developer Treasure Co. Ltd, Grapple Force Rena combines the familiar aesthetics of the 16-bit era with its own unique brand of grappling gameplay. It's quite simple, but the simplicity feels like a strength they play on quite well with the grapple mechanic being used to great effect. In that respect, it reminds me a little of Iconoclasts. I found myself smiling while playing it, which is quite rare for such a retro-inspired title for me. It's the simple things, like having an enemy with a shield, except you can hook the shield away from them and throw it right back—highly amusing. There's a lot of charm to be found here for sure, I certainly liked what I played in the demo on Steam which works rather well. If you like a good action platformer with a solid retro hook, this is probably worth a look. Wow. There are a lot of new platformers coming on the market lately. This one looks fun as well. Thanks for checking out the demo.